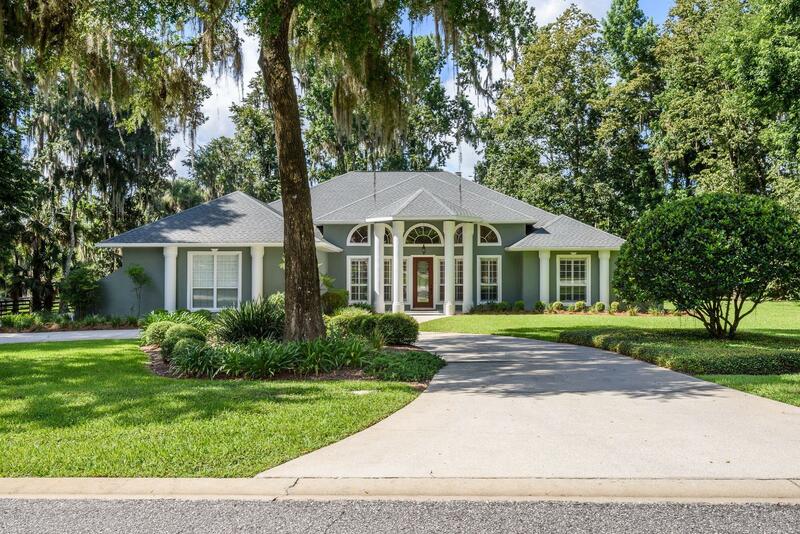 Beautiful 4/3 in Country Club of Ocala. Foyer opens to formal living & dining rms, which opens to spacious family rm w/fireplace surrounded by granite. Kitchen, w/stainless appliances & breakfast bar, leads to informal dining area & opens to tiled Florida room, extending across back of home. Master suite includes oversized master bedroom w/plenty of room for a sitting area & master bath w/double vanities, walk-in shower & jacuzzi tub. Recently updated w/wood-look tile flooring, new paint & light fixtures. Other features include wood flooring in bedrooms, plantation shutters, 10' & 14' ceilings & 750 sq ft screened patio, which overlooks nicely landscaped & treed backyard. Along with 2 car attached garage, property also has a detached 2 car garage, which could be converted to in law suite.